Author(s): Nathalie R. Wingert, Laboratorio de Controle de Qualidade Farmaceutico, Ipiranga 2752, lab. 402, Faculdade de Farmacia, Universidade Federal do Rio Grande do Sul, Porto Alegre, Brazil. Matheus A.G. Nunes, Amanda T. Barden, Patricia Gomes, Edson I. Muller, Erico M.M. Flores, Martin Steppe. 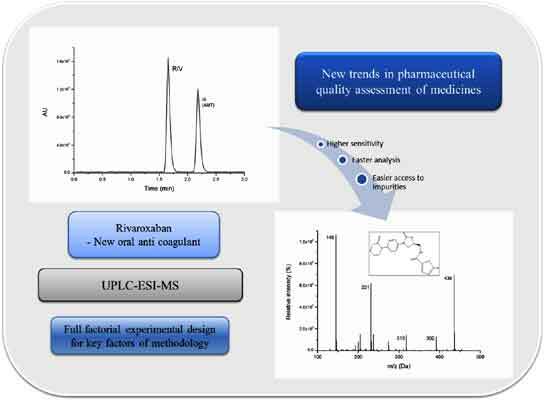 Sensitive, fast, and precise UPLC-MS/MS analytical method was validated for the identification and quantification of the anticoagulant rivaroxaban (RIV) in pharmaceutical dosage form, using a full factorial design for robustness assessment. Chromatographic separation was achieved in 3.5 min on a C18 Zorbax Eclipse Plus (rapid resolution HD) Agilent® column at isocratic elution mode. Ultra pure water adjusted to pH 4.0 with ammonium hydroxide and ACN (63:37), both phases containing 0.1 % formic acid, was used at a flow rate of 0.2 mL/min. Detection of RIV was carried out with a quadrupole time of flight mass spectrometer detector equipped with an electrospray ionization source which was applied on positive mode. Internal standard substance was used to ensure small variations between analyses. Validation parameters were evaluated and the results found within acceptable ranges. Linearity was evaluated from 1.0 – 50.0 μg/mL, presenting a mean of 0.9970 (r2). Relative standard deviation was within 2.57 % to intra and inter-day, and relative error for accuracy ranged from -0.16 % to 1.85 %. The four factors selected to evaluate method robustness by a full factorial design were flow rate, injection volume, column temperature, and ACN concentration; the responses were found to be not significant for RIV quantification. The proposed UPLC-MS/MS method was successfully validated regarding linearity, specificity, sensitivity, precision, accuracy and robustness, allowing fast and reliable analysis of RIV along with multiple compounds (impurities and degradation products) simultaneously, affording the use of a hyphenated technique in quality control studies. Keywords: Experimental design, mass spectrometry, rivaroxaban, ultra performance liquid chromatography. Affiliation:Laboratorio de Controle de Qualidade Farmaceutico, Ipiranga 2752, lab. 402, Faculdade de Farmacia, Universidade Federal do Rio Grande do Sul, Porto Alegre, Brazil. Keywords:Experimental design, mass spectrometry, rivaroxaban, ultra performance liquid chromatography. Abstract:Sensitive, fast, and precise UPLC-MS/MS analytical method was validated for the identification and quantification of the anticoagulant rivaroxaban (RIV) in pharmaceutical dosage form, using a full factorial design for robustness assessment. Chromatographic separation was achieved in 3.5 min on a C18 Zorbax Eclipse Plus (rapid resolution HD) Agilent® column at isocratic elution mode. Ultra pure water adjusted to pH 4.0 with ammonium hydroxide and ACN (63:37), both phases containing 0.1 % formic acid, was used at a flow rate of 0.2 mL/min. Detection of RIV was carried out with a quadrupole time of flight mass spectrometer detector equipped with an electrospray ionization source which was applied on positive mode. Internal standard substance was used to ensure small variations between analyses. Validation parameters were evaluated and the results found within acceptable ranges. Linearity was evaluated from 1.0 – 50.0 μg/mL, presenting a mean of 0.9970 (r2). Relative standard deviation was within 2.57 % to intra and inter-day, and relative error for accuracy ranged from -0.16 % to 1.85 %. The four factors selected to evaluate method robustness by a full factorial design were flow rate, injection volume, column temperature, and ACN concentration; the responses were found to be not significant for RIV quantification. The proposed UPLC-MS/MS method was successfully validated regarding linearity, specificity, sensitivity, precision, accuracy and robustness, allowing fast and reliable analysis of RIV along with multiple compounds (impurities and degradation products) simultaneously, affording the use of a hyphenated technique in quality control studies.